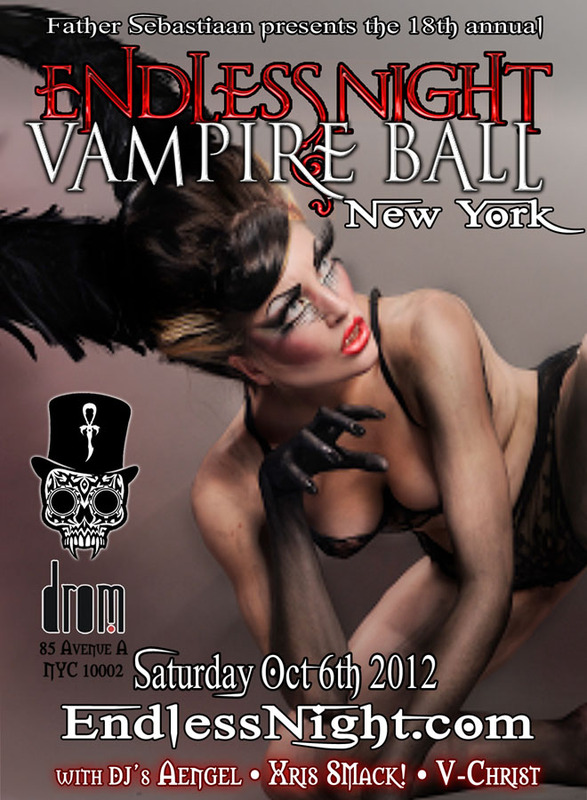 Endless Night Vampire Ball 2012 in New Orleans we cordially invite you to...THE NEW YORK VAMPIRE BALL! Hosted by Impresario Father Sebastiaan and Maestro Victor Magnus. Mistress of Ceremonies, Empress Chi Chi Valenti of MOTHER and Jackie 60 Fame will guide you through a delightful evening of elegant delights. will spin the new playlist including the Endless Night Top 230 Vampyre songs of all time! and entranced by the burlesque show of Lily La Vamp. Go-Go dancing by Tracy Wayne Gacy & Gigi Rose. Make an offering to our events patron at the Altar of Fred Samedi. Bloodbath and Absinthe drink specials all night. Join our costume contest with the grande prize of two Platinum Tickets to Endless Night in New Orleans 2012. by your gatekeepers Mandanna and Maestro Victor Magnus. Tickets are $18 for General Admission in advance, $35 for couples online with our server from EventBrite on EndlessNight.com or at Gothic Renaissance 110 4th Avenue NYC. 212.780 9558. Door tickets are $25 so please purchase your tickets in advance and our last Halloween event sold out. Father Sebastiaan will be making fangs at the FangShop NYC on October 1st-25th by appointment only!